Dress – Either Asos if you’d like the dress to be pure white or Hurleys/Fantasia Boutique for the same peach white colouring of the dress in the picture. Similar white Lace coat – YesStyle or AliExpress – The latter coat can double as both a dress and/or a coat. Shoes – Exact match at Missguided! I hadn’t ever thought about combining white lace together in one outfit before I saw this woman. She truly was able to pull it off and had such a sweet look about her! Adore peach white lace dress underneath the coat, a slight throw off from the rest of the pure white colour scheme but it worked beautifully. Earlier this year there was an influx of white in Spring collections. Broderie , brocade, lacework, you name it. This trend has seemingly leaked into Autumn/Winter collections and the Moncler Gamme Rouge collection Autumn/Winter 2013 at Paris Fashion Week is a prime example! Perhaps a little over the top for some people and none can attest that it was beautifully executed. The ethereal white colour scheme, the glittering crystals, mirror panels and snowflake detail on the winter gear brings the White Witch Queen of Narnia to mind almost instantly (for those that have either read the books or seen the movie anyway). 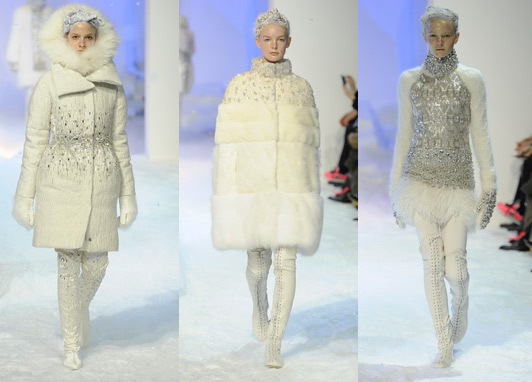 Overall it created a grandiose imagery of seductively beautiful, well dressed, icy hearted winter fairies. White is often thought to be semantically linked with purity, innocence and most of all the season of winter. What other way would there have been to bring out all of these elements other than to parade statuesque ice maidens down a catwalk dressed in the colour that ties it all together? I’m going to take my own advice through the apparent ardour I have for this particular collection and invest in a beautiful white winter coat now. London Fashion Week is also officially over! It was great, it was good, it was inspiring, it was awe-spiring and we must sadly say goodbye to it until next year. I wasn’t able to go to any shows this year but definitely will in 2014! If you’re interested in buying tickets to the events which will be held at Somerset house, this link will direct you where to go. Hope you’ve all had a lovely London Fashion Week and are looking forward to the next as much as I am!